Seems like many bloggers are busy preparing projects for their children's school auctions. I've read about very ambitious projects here and here and undoubtedly there are many more in the works elsewhere! This one is so pretty - it is made from Amy Butler's "Nigella" home dec weight cotton, which is simply gorgeous. A google search found it for a shockingly reasonable price of $13.95/yd here. (hope you're not on a fabric diet). 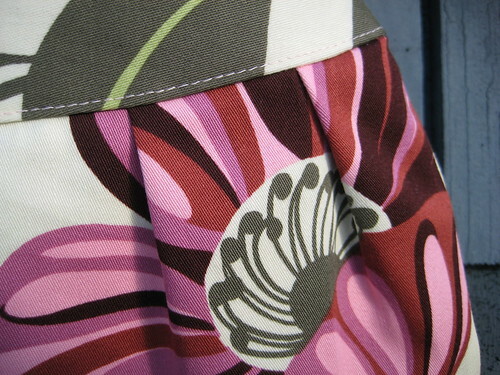 The lining is a Kona solid which just might be Herb. Unfortunately, my machine didn't really like the only pink thread I had for topstitching, but after picking out twice I decided to leave the few little thread blobs on the bag's inside (man, I really dislike those. I tightened up the top tension, changed the needle, cleaned the bobbin case, all to no avail. My Pfaff and Mettler thread are like oil and water). I was afraid of damaging the home dec fabric with repeated needle-punches....you know how it can get little runs in it? It looks perfect on the outside. So only me and the generous buyer, and 338 of you need to know (you won't tell, right? Thanks). Speaking of which, I am completely stunned that so many of you have clicked on that little 'follower' button. Yes, stunned, thrilled, happy, appreciative - all of that and more. That you all want to hang out here and see what I'm making/photographing/blathering on about is incredibly special to me. Thank you so very much. Every time that little counter goes up by one, I feel like I've made a new friend (and no matter what anyone says, that's a kindergarten feeling that I think everyone still loves). A giveaway is in order when that number reaches 350, don't you think? Definitely a milestone I want to celebrate with all of you! Now, I've mentioned it here before, but if you would like to make these sweet bags to sell at craft fairs or to friends, Rae has a licensed version of her pattern for sale at a ridiculously reasonable price of $10. I bought one just because I was making so many bags and wanted to support her generosity. Her blog sidebar is full of other wonderful FREE tutorials, so definitely pay her a visit. I love this bag! It instantly went into my top things-to-make pile. I have been roped into helping for a school auction too. I have to sandwich, quilt and bind T's class quilt. The auction is 3 weeks away and I have yet to receive it... I love the bag! 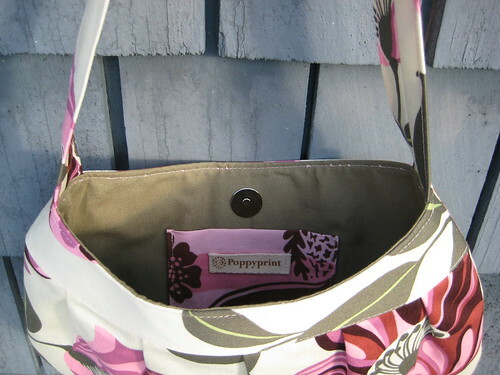 Cute, cute, cute bag and love that fabric! every time I see you make another one of these, I want to make it! I am also an auction-making mom ;) I am doing a quilt for preschool, and each of the kids are writing on a fabric leaf to be appliqued to a tree. Fun- but of course I thought it would take less time than it has...I always think I can whip it off quick! Two weeks left to pull it all together! I think the top stitch on the bag is more than perfect, Krista! I would not have noticed the thread blobs if you hadn't mentioned it, and I am sure everyone feels the same way..because it's too perfect outside!!! What a fabulous bag and aren't you lovely to make a bag for an auction for a school your kids no longer go to. I am loving Boy month on Rae's blog! She always has such great stuff! Your bag is just wonderful! I love the colors! Lucky me! I won the silent auction bid. OK so I might have drawn a vertical arrow down over a couple of price spots to jump the price up, just to show any prospective "outbidders" that I was serious about nabbing this little beauty. Krista you are ever generous for donating your precious handiwork. Thanks! What a lovely looking bag! Love the floral print! 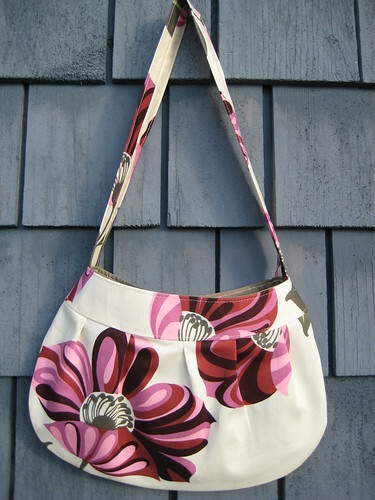 Love the red floral print on that gorgeous bag!